Since 1980, the 'Rossini Opera Festival' has taken place every year in Pesaro. It is dedicated to Gioachino Rossini�s multi-faceted body of opera work. From 1809 until 1829 he composed 39 operas, many of which are the standard repertoire to the great opera houses around the world. In Pesaro, many lesser known gems from Rossini�s oeuvre are presented with verve, pluck and elegance. In this, the 25th year of the Rossini Opera Festival, Arthaus Musik has gathered four highlights in its release of Rossini Opera Festival Collection � Live From Pesaro. 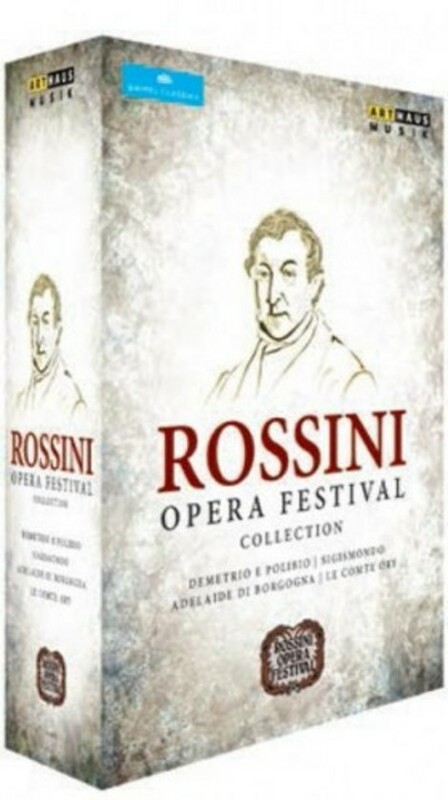 The featured operas range from Rossini�s first work, 'Demetrio e Polibio', to his 'Sigismondo' � a work the maestro composed as an opera buffa in 1817 but which has slowly slipped into oblivion � to 'Adelaide di Borgogna', Rossini�s first serious opera, and his late opera, 'Le Comte Ory', a smash hit in 1829 and on the programme of Op�ra de Paris and other international stages for decades. This collection offers a cross section of the great composer�s opera creation that shouldn�t be missed by any fan of Rossini�s work.